Arte povera was never an art simply to look at, but to experience with every sense, and this rich Jannis Kounellis retrospective exemplifies the ways in which the Italian movement went beyond a Minimalist preoccupation with the visual apprehension of form and process. 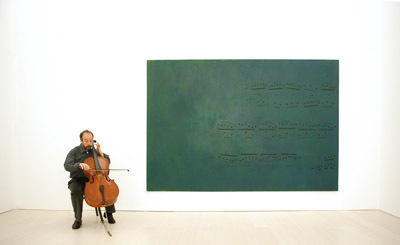 From the tannic scent of coffee meted out on a column of iron scales, to the colorful notes of a Bach sonata played live by a cellist, to the searing heat thrown by dozens of lit propane torches, Kounellis’s works perform a Brechtian assault on the senses from the first step into the galleries. These works oppose the self-referentiality and gestalt of contemporary primary structures. Employing such materials as musty burlap sacks of grain, rusty bed frames, burned chunks of coal, and weathered wooden tables, Kounellis instead elicits latent memories of physical experiencesa palimpsest of times and spaces beyond the gallery. Our image of the artist has been limited in recent exhibitions due to restrictions on the inclusion of live animals and to the fire hazards posed by the propane torches. Here, however, one finds the aforementioned cellist, a live parrot (tethered to a painting), a tank of fish, and twenty individually caged sparrows. Further, Kounellis stabled twelve horses in the MADRE galleries for the opening weeks, in a restaging of his famous 1969 exhibition at L’Attico gallery in Rome. This retrospective offers a rare opportunity to fully experience the confrontation of Kounellis’s bold works as they were intended.